In the last year of Governor-elect Jerry Brown’s previous term as governor, 1982, he signed two bills that dipped into CalPERS reserves, taking a total of $433 million to help balance the state budget. Last week the incoming governor’s finance director, outlining a budget shortfall that could be $28 billion during the next 18 months, put pensions at the top of a mountain of long-term debt. “The first is pension liabilities. Much has been discussed about our pension liabilities,” Ana Matosantos told a budget forum televised on CalChannel and webcast over the Internet. Numerologists looking for a portent of the pension reversal might note how the number of years that have passed since Brown’s first term, 28, is a reversal of the last two digits of 1982. But more seriously, legislation in 1982, a year with a wide range of pension legislation, seems to have foreshadowed, or even laid the groundwork, not only for much of the current public pension problem, but for what some think is a solution. —An unsuccessful legislative ballot measure, Proposition 6, tried to allow bond-based pension funds to increase stocks from 25 to 60 percent of investments. Then Proposition 21 in 1984 completely removed the stocks cap. Later CalPERS and others would say pension increases could be paid for by stock-fueled investment earnings, not taxpayers. —The taking of CalPERS reserves in 1982 was structured, in part, to boost the budget for other worker programs. When Gov. Pete Wilson’s budget in 1991 took $1.8 billion from CalPERS, unions called it a “raid” and got voter approval of Proposition 162 a year later. The initiative gave pension boards total control of funds and strengthened their power to set annual rates that must be paid by government employers. —Brown’s 1982 budget proposed lower pensions for new state employees, arguing that CalPERS and Social Security gave some retirees more income than they earned on the job. Budget legislation authorized lower pensions, but whether that happened is not clear in available records. Now “two-tier” benefits and higher worker contributions are the most common attempt to curb soaring pension costs. Legislation in 1982 also authorized the California State Teachers Retirement System to create its own investment unit and to obtain a new headquarters building. CalSTRS investments had been handled under contract by the larger California Public Employees Retirement System. In the nearly three decades since Brown left the corner office in the Capitol, a visible sign of the growth of the nation’s two largest public pension funds is their impressive new buildings. CalPERS moved into a new $81 million building in 1986, followed by a $265 million expansion in 2005. 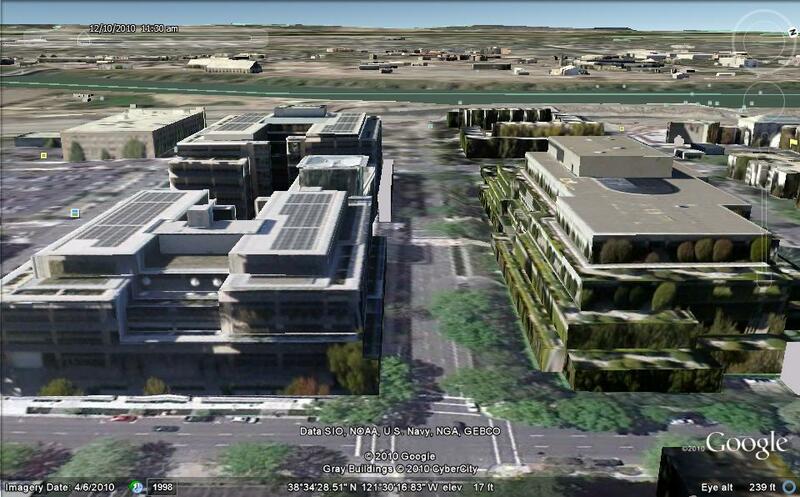 The one million-square foot complex covering four city blocks was said by the expansion contractor to be the most expensive building, per square foot, ever erected in Sacramento, topping the earlier CalPERS building. 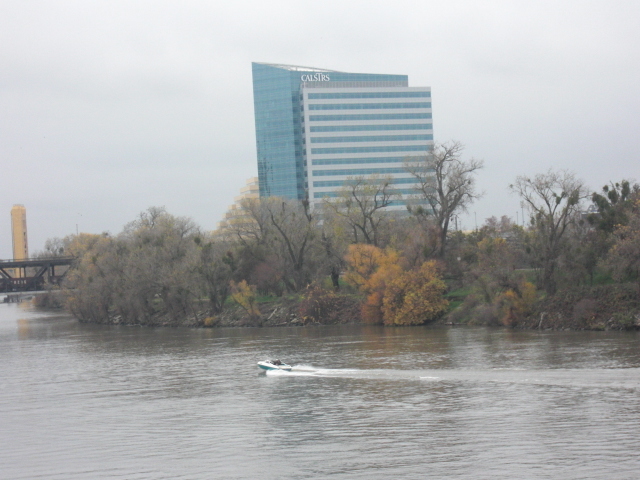 Last year CalSTRS moved into a $276 million, 409,000 square foot landmark building on the Sacramento River, a 13-story office tower atop a five-story garage. Nearby parcels also purchased by CalSTRS in 2006 near the height of the real estate boom could be used for offices and condos. In 1982, part of an urgency measure to help balance the state budget for the fiscal year ending on June 30 reduced the state payment to CalPERS by $179 million for three months. A similar amount, $179 million, was transferred from the CalPERS reserve to the CalPERS fund, replacing the cut in the state contribution. The budget for the new fiscal year that began July 1 used $254 million in CalPERS reserves to finance state spending. Much of the amount was spent on the increased cost of health and dental insurance, overtime and shift differential salary adjustments, and a $50 per month reduction in employee CalPERS contributions instead of a salary inflation adjustment. The CalPERS “reserve for deficiencies” in 1982 was nearly $1 billion. The current $100 billion unfunded liability mentioned by Matosantos at the forum is the shortfall over the next three decades projected by the pension funds. The pension funds use their earnings forecast, currently about 7.75 percent a year, to offset or “discount” the projected debt. But some economists contend that the earning forecasts are overly optimistic and conceal massive debt. The economists argue that a lower risk-free bond earnings rate should be used because public pensions are risk-free, guaranteed by the taxpayer. Stanford graduate students, using a 4.1 percent bond rate, calculated that state pension funds have a $500 billion shortfall. The outgoing governor, Arnold Schwarzenegger, obtained legislation in October requiring, among other things, that CalPERS include a debt calculation using a risk-free discount rate when setting annual state payments. The Governmental Accounting Standards Board is considering adopting a blended discount rate for pension funds. Any part of long-term debt not covered by the earnings forecast from a diversified investment portfolio would be measured at the risk-free rate. A trio of Republican congressmen, including Darrell Issa of Vista and Devin Nunes of Tulare, introduced a bill this month requiring state and local governments to calculate pension debt at the risk-free rate if they want to sell tax-free bonds. A New York Times business columnist, Floyd Norris, argued last week that a rule change requiring corporate pensions to report larger debts encouraged the private sector to switch from pensions to 401(k)-style individual investment plans. “Now something very similar may be in store for public sector employees, thanks in part to the Republican victories in last month’s Congressional elections,” Norris wrote. Brown takes office next month in an atmosphere of alarm about public pensions, driven in part by huge investment losses in the stock market crash two years ago that require much higher employer contributions to begin replacing the losses. Schwarzenegger, after a record 100-day budget deadlock, got the largest state worker union to agree to increase employee pension contributions and give new hires lower pensions, similar to earlier agreements with a half dozen smaller unions. But Brown will have to negotiate new labor contracts with another half dozen unions, representing about a third of state workers. They held out, hoping for a better deal from the new governor. Brown not only made an early “two-tier” proposal for new hires (current workers have vested pension rights protected by contract law). His campaign this year included proposals for higher worker pension contributions and lower benefits for new hires. This entry was posted on December 13, 2010 at 8:55 am and is filed under Brown. You can follow any responses to this entry through the RSS 2.0 feed. You can skip to the end and leave a response. Pinging is currently not allowed. The DB Plans need to go … for CURRENT as well as NEW workers. Insolvency is the ONLY other option (taxpayers WON’T pay… they’ll just move out of State). The DB plans will go Tough Love, it is mathematically impossible to pay them. You cannot have 50 year old cops and ff’s, and 20 other occupation receiving the safety pensions, living to age 85 getting 2-3 times in retirment than when they worked, and getting 5 or mor years longer than when they actually worked. What’s interesting due to the Union’s biggest protection for it’s oldest members is how the newer and middle career members will eventually be thrown under the bus so the retirees can continue to collect their excessive pensions. I suppose these newer and middle career members still hope/pray they too will get there. Not a chance. The sooner they end the excess for the older members the more (but still not much) will be left for them. If they don’t demand change soon, even their contributions will disappear into the abyss. Retirement benefits that have already been earned cannot be modified based on Federal law. This does not prevent revisions in the available retirement benefits in future years. I started with a local government when they has 2% at 60. Since then, the program was changed to 2% at 55 and then 2.7% at 55. Each time, the agency had to pay additional contributions over a transition periot to cover the additional benefits. If the program dropped back to 2% at 60 for 2011 and beyond, the prior accrued benefit would still apply even though new accruals would be lower. . .
(1) While I agree that Pension accruals for CURRENT employees should ONLY be changed for FUTURE years of service (and that such reductions are both allowed and routine in Private sector Plans), public sectors Unions universally claim that such reductions are not allowed for CURRENT vested employees even for FUTURE years of service. Unfortunately, the legality of this legal position (while not fully tested) has some basis in fact in certain States (California being one of them). In the end game, running out of money combined with the inability to raise taxes to generate sufficient revenue (people/businesses can just move) will be the determinant of change even in States WITH such restrictions. Since YOU paid absolutely nothing towards these retroactively granted increases, when you say the “agency” had to pay additional contributions to make up for this, you really mean the “taxpayers” … without their permission (other than via the elected officials who approved this and are generally do the Union’s bidding in return for campaign contributions & members’ election support). I doubt that if polled, Private Sector taxpayers would have voluntarily increased your Pension RETROACTIVELY. BGM: I was working at a Muni in 2002, when the formula for our CalPERS pension plan, for miscellaneous members, was raised from 2% at 55 to 3% at 60. In 2005, my employer changed the safety formula of 3% at 50 back to 3% at 55. Then, in following years, they changed the 3% at 60 plan back to 2% at 55, and last year, the miscellaneous plan was put back to 2% at 60. The changes apply to new hires only. The employees who were still working at my muni when I left will keep the 3% formulas for their current and future accrulas, until the time they retire. This year, AG Brown filed an Amicus Brief, as a friend of CalPERS annuitants, for the upcoming Moorlach appeal in OC. The Brief explains that the DB pensions, which originated in CA 97 years ago, were adopted by the legislature, retroactively, each time. There is nothing to stop new Governor Brown from proposing legislation that new pension upgrades will not be retroactive. But, in the meantime, people who continue to slander and libel active and retired public employees as crooks who committed theft, should desist in their badmouthing attitude, because they, and I, did nothing wrong. It was all legal by action of the CA Legislature. TL: BGM is a taxpayer just like any private sector worker; any funds paid, individually, by the taxpayers of BGM’s district would also be paid by BGM. Don’t retreat to that old argument that BGM was given his/her money by the taxpayer–he/she earned that money by providing a service. In the meantime, unless respective taxing districts have special assessments charged to the district’s respective constituents, for the purpose of funding pensions, money being paid to the pension plan is a line-item amount that is taken from incoming revenue. Do you really believe, TL, that if pensions were to be disbanded tomorrow, the individual taxes of the taxpaying citizens in CA would go down? Since the yearly total payment to CalPERS by the State of CA is now 3% of the total budget, how on earth can the present and continuing state Finance Director declare that it is the number one problem for the CA budget? She is just continuing on with Swartzneggar’s BS. SeeSaw, We’ve been through this numerous times before. Civil Servants always support (and more recently DEMAND) tax INCREASES (while few others do). They do so because there is most often a net benefit to them. For simplicity say all taxpayers make the same income and in the same marginal tax bracket, and 15% of all taxpayers are Civil Servants (a typical percentage). Again, for simplicity, lets assume the entire taxpaying population is 100 people (15 Civil Servants and 85 Private sector workers). Also lets say the increased revenue needed is $10,000, so each of the 100 taxpayers will contribute the same additional amount of $100…. because 100x $100 =$10,000. As a group, the Private sector taxpayers contributed 85x $100=$8,500 and the Civil Servants contributed 15x$100 = $1,500. But recall that 50% of that increase is ONLY going to support Civil Servant pensions and benefits. The Civil Servant group contributed $1,500 but will get back (as a group) 50% of $10,000=$5,000, over 3 time what they contributed. The Private Sector taxpayers contributed $8,500 but will only get back $5,000 or lees than 60% of what they contributed. It’s no surprise Civil Servants support tax increase … they almost always BENEFIT from them. And yes, you can easily challenge this workup by saying the 50% assumption is too high. Actually, in most cases (now & in the future) it will like be even higher. Assuming you mean that the DB Plans would be frozen (for CURRENT employees) and replaced with a pension (for future years of service) no greater than that of the average Private Sector taxpayer ….. NO, there would no be a substantive immediate decrease in taxes (but only because the financials of our significantly underfunded pension Plans only account for service already rendered), but it would WITHOUT DOUBT end the GUARANTEED disastrous tax increases (or more likely Plan failure do to an inability to significantly raise taxes) bearing down on us for decades to come…. to pay for FUTURE year pension accruals based on CURRENT Plan formulas and provisions. Now if you were to say … end retiree healthcare …. YES, there would be a VERY substantive and immediate decrease in taxes because these plans are paid-for on a pay-as-you-go-basis. I can’t believe you’re still repeating that 3% contribution nonsense …. all BS. What matters is NOT what CA contributes, but what it NEEDS TO contribute to fully fund the Plans. The latter is likely 5-10 times the 3% figure. TL: I attended a CalPERS sponsored forum last February where the presenters were all non-CalPERS principals. In a question and answer session, we learned that the total amount of its budget that the State paid yearly into CalPERS was 2.5%. That’s why I said 3%–with the economy not improving in the past year, I figure that the cost has gone up. If you have proof of different figures from credible, published sources, bring them on. You sure seem to have a lot of concern about CA, when you don’t even reside here. I hope things are going ok in your own state. I wish the principals in your state no ill–too bad you can’t do the same for us in CA. (1) in your 2-nd sentence is the word “paid”. That was my earlier point they are PAYING a VERY small portion of what the NEED TO BE PAYING to fully fund the Plan. The latter is key, not the former. (2) Unless the excessive Pension & benefits promised CURRENT (not just new) Civil Servants are reduced …. materially and soon …. the tsunami this will bring forth will make the financial crisis of 2008 pale in comparison. I could have worded it differently. The proper wording should have been, “The State of California’s yearly obligation to CalPERS is 2.5% of the its total budget”. Sine your denominator is the State state budget, then the Numerator in determining ratio should be contributions to ALL State Public Pension Plans in Calif., not just Calpers. Just ANOTHER reason the figure is meaningless….. typical of of the misleading/self-serving information that comes from Unions. Another Union favorite is citing the “average” pension payout …. WITHOUT pointing out the VERY material fact that such an “average” includes those who retired decades ago at much lower salaries, as well as part-time workers and short career workers with smaller pensions. You NEVER see a public sector Union publish an apples-to-apples factually relevant compensation comparison (because thy will ALLWAYS come out as overpaid). (3) the % of those in (1) whose pensions included a post-retirement COLA. # (1) above alone is likely AT LEAST double in the Public Sector. Add in the incremental value from the MUCH earlier retirement ages and from Colas (from (2) and (3)) and the “VALUE” of the Public sector pension at retirement rises to 4+ times that of the comparably paid Private Sector worker. As to you earlier comment that I do not Live in CA. ………., that is correct, but the basic problem is similar in all but a few states whose elected official had the strength of character to resist the excessive demands of their Civil Servant Unions. Sure CA, along with NJ, Mich, NY, Ill, PA, RI, etc. are in deeper than most others, but ALL share the fundamental problem of promising WAY WAY WAY more than is (a) sustainable, and (b) fair to taxpayers. The tsunami bearing down on us will be equally intense, but different from the 2008 financial crisis. In that one, our ire was directed at the Wall Street ilk. In this one it will be a middle class “people” fight ….. Taxpayers VS Civil Servants, Retirees VS those currently working, younger workers VS older workers….. all trying to hold onto “their” piece of a rapidly diminishing pie. What don’t you understand when those with impeccable credentials say that we will NEVER have the money to pay for these promises? Is it better to wait until the whole system collapses and the chaos begins ? My respective pension plan is on solid footing. I do have concern for what is going on in San Diego–concern for those members, because they are my fellow CA citizens. I would not think of getting into the business of New Jersey and start telling those officials what they need to do with their constituents. Perhaps you should narrow your horizon a little, to work in an area and on things that you can participate with in a positive manner. Try to help shore things up–not bring them down. Seesaw, Is the glass half full or half empty ? Righting the “wrong” perpetrated on Private Sector taxpayers requires fixing the “injustice” of excessive pension & benefits promised Civil Servants. I do not look upon that as “bringing things down”, but as you said, “shoring them up”. TL, don’t be lead off by that old “kill the messenger” attack. You facts are right on point and applicable to California. As a Native Californian, I don’t care where you come from because your message is relevant. Thanks Chris ….. it’s a very lonely battle. Of course it won’t be won via these blogs, but hopefully mainstream news media are picking up on the more intelligent comments coming from bloggers (hopefully I’m one of them), and bringing it the attention of those in a position to change things via mainstream reporting. The big nut is make it clear that changes only for NEW employees are woefully insufficient. The big nut is making it clear that changes only for NEW employees are woefully insufficient. You should read this (link below) and tell me if you still think so. Yes, I still think so. Authors writing these articles are a dime a dozen–otherwise how would they make a living? You have the right to believe whomever you want to believe. I will use the same priviledge to choose whom I want to believe. And, I am a CalPERS member, so I will rely on them until they tell me differently. SeeSaw, The “We” at the beginning of your 2-nd sentence is “CalPers” opining on IT’S OWN financial strength. Didn’t Bernie Madoff say the same thing ? And didn’t Bernie Madoff’s investors “rely on him” … until (well) it was too late ? The opinion of unbiased OUTSIDERS is relevant, not those of self-interested parties. In an opinion piece in the Los Angeles Times, State Treasurer Bill Lockyer got on his high horse to state “California isn’t broken,” won’t default on its debt payments, and isn’t anti-business. You can’t be serious. Everything you say points fingers at the unions. NOBODY ever mentions that the STATE, COUNTIES and LOCAL GOVT leaders pissed away BILLIONS while contributing NOTHING to Public Employee Pensions for 10 years. The employees kept on paying their shares. Now, after reaping the rewards, expanding government services and entitlements, Huge ancillary staffs, PG&E rip-offs. Now you want to blame the pensions that 5 years ago were perfectly justifiable? Give me a break. Unions exist to improve the wages and working conditions of their members. They negotiate and receive what is agreed to. In the case of Public Safety unions, they don’t even have the ability to strike. Where is all of this so-called power coming from? You act as if a union can just go tho the negotiating table and name their own deal – it doesn’t work that way. This dooms-day outlook is typical of people who are suffering ( or think that others are getting too much, whatever that means). If only their neighbors suffer then it will somehow justify their own suffering. Stop whining, screwing over public employees isn’t going to improve your lot in life. By the way, you aren’t one of the more intelligent bloggers. You seem able to only see one side. BlueGardenMom and others who think their California State pensions are safe due to federal law are going to have a huge surprise very soon. Darrell Issa, among other Republicans, are calling for a new law which will allow States to declare bankruptcy. Bankruptcy law trumps all other law, ERISA included, all it takes in bankruptcy is for the BK judge to agree the pensions have to be cut or eliminated to save the State and it is done. No appeal. I know, I lost my 36 year pension due to a bankruptcy. Don’t be so cocky, the taxpayers in a bankrupt State do not care about your pension and will not raise their taxes so you can stay at home and not work. The fact your pension was “earned” has nothing to do with it. Prepare for the worse and you might come out of it OK. I am an IT worker employed in the public sector here in California and covered by CalPERS. My salary is AT LEAST 35% lower than workers in a comparable job in the private sector. I am here for the PENSION. If it weren’t for the PENSION, I would be working somewhere else and making much more money and probably getting a nice match on my 401K contributions. So all of you fence sitters who think that getting rid of the DB pensions is the budget panacea, keep in mind that the state and municipal jobs that now pay BELOW MARKET salaries would have to pay HIGHER SALARIES RIGHT NOW to attract and retain qualified workers. Tough Love— seriously my friend– your agenda is a mile wide and an inch deep. SeeSaw and the others out here are more than a match for you— you still don’t honestly seem to understand all of the math? What gives? You seem a ton smarter than this?? ?